I went to read your blog and Facebook posts. It gave me a fresh take on tuition. Your tuition stands out from others, because it is different from other tuition centres, in a refreshing way. I have seen many tutors advertising using the same old techniques (“I am a top student”, “I teach techniques” etc), but not many focused on making learning fun and interesting. That’s a keen observation! First of all, I don’t really call myself a tutor these days. If you happen to receive my biz card or look up my profile on LinkedIn, you will know that I call myself an ‘educator’. I believe there is an early stigma on “tuition” – you tell some people that you give tuition, you may receive a response that it is an odd job. Or maybe, just some passive income stream, nothing serious. Truth be told, the tuition industry in Singapore is so wide as there are very low barriers to entry. I have seen ads by O level students (some still awaiting results) out to find tuition assignments. Some lucky ones may be able to fetch some assignments by pricing their fees low. Spoil market? Not really. The more discerning parents would know that sometimes, heavier price tags come with better quality and experience. Not to say that tutors offering cheap rates could not teach of course! But when you charge a higher premium, parents expect quality. So it’s really up to you to deliver the goods, if not they have no qualms about finding another tutor in the vast tuition market. While I started off giving tuition when I was in the army (12 years back), it was solely because I needed an extra allowance to fund my weekend escapades. Well, you know how “good” our NS pay was back then. *laughs* Fast forward 10 plus years later, I have never once stopped giving tuition. I took it up as part-time while I tried my hands on different job stints, including a magazine writer, a copywriter in a branding agency, as well as an Assistant Manager in Corporate Communications in a reputable institution here. And I realised I have never dreaded teaching as much as I had my reservations for certain job scopes. Honestly speaking, if I am not teaching now, I would probably be dabbling myself in doing creative work of some sort. And when I decided to quit a particular job 3 years back, I dived right into doing full-time tuition. Why do I call myself a bilingual educator, you may wonder? ‘Bilingual’ because I am pretty confident of both my English and Chinese proficiencies, and also because I am able to explain terms and concepts in both languages; ‘Educator’ because the word itself has a long-term connotation. (Just like how parents are the “overarching educators” of their children). It is always my belief that language learning, in particular, should be a lifelong subject. Ask yourselves this question: Have you ever lost touch with language in any way? Also, with every student I teach, it is with a “prolonged” commitment in mind that I accept the assignment. After all, I hope that whatever I have taught them in class could help them navigate the seas of the future, wherever their endeavours may lead to. Personally, I don’t like to adopt techniques like “selling koyok” (卖膏药) – Straight A’s student, top student, etc. To each his own, but I have seen some tutors who are still harping on their ‘O’ level results achieved in 1984, for example. While you may be a straight A’s students back then, it does not necessarily translate to the current education landscape, especially with our curriculum and syllabus changing all the time. Comprehension questions in both Chinese and English papers in primary school, for example, have changed since our times. While we used to “copy and paste” a lot, a lot of questions now test you on reading between the lines – inference questions that require you to think and elicit a personal response. So do your past accolades as a student mean anything today as a tutor? I realized you like to use music to help make learning Chinese interesting. This is something very, very few people use. Most people just go to the student’s house, do some assessment practices, that’s all. Do you encourage people to use music more often for tutoring? I am actually one of the “jia gan dangs” you mentioned haha. What do you think is the real reason Singaporeans speak broken Chinese, and how do you think we can solve this problem? Well, this is actually a pretty obvious trend. More and more younger Singaporeans come from English-speaking family backgrounds, with parents who are English-educated and tend to converse more in English at home. I come from a Chinese speaking family and have been speaking Mandarin since young (not to mention listening to Hokkien from my folks). When your parents speak to you in English at home, and you continue spending a large amount of your time in school exchanging English tongues with your peers, there is no way you could speak perfect Mandarin. The best way to solve this problem is to go live in China for a good 10 years! I guarantee that you would come back with a fat Chinese vocabulary bank. But of course, this may be a ludicrous idea for many. A better alternative is to mingle with friends from China, Taiwan, or anywhere with Chinese as their native tongue. I believe it is not hard to find such friends if you look close enough! They are everywhere in town! Other ways I would recommend is to keep yourself entertained by watching good Chinese dramas, movies and variety shows in Chinese. There is already a plethora of on TV and online. I know it is futile to coerce you (the ‘jia gan dang’ clans) to read the Chinese papers or flip pages off a Chinese novel every day, so I am providing a very good substitution here! 😛 The whole idea is to immerse yourself in Chinese as much as possible. What is the biggest mistake that tutors often make? You have to go beyond checking of answers and marking the work. Instead, tutors should always help students develop their voice (in writing). And also, do remember that language learning is not exclusive to writing – you have to work on the oral and listening components as well. What is the biggest mistake that parents or students often make? For parents, it is to rely on the tutor to do everything. While we tutors should definitely do our jobs as we are getting paid, parents can help to guide their children along whenever the tutor is not around. There should be some form of independent learning here. My personal practice is to give a debrief to every parent (usually the mum if she’s at home) after each lesson. I think it is imperative that they understand what their child is learning, and what could be done to improve. For students, again, it is to rely on the tutor to provide all the answers. Higher learning is no longer about “A for Apple, B for Boy, C for Cat”, you get the drift. You have to make your own connections and practise, practise, practise! Students need to be more proactive in learning. Keeping a diary or blog is a good way for practice and tutors can help provide constructive comments after each post. I encourage my students to do that, and even allow them to add photos and pictures as and when they like to do so. It doubles as a good way to peer into the student’s attitudes, behaviours and life happenings. These will give you a good idea on how to tailor materials in order to coach them better. What’s your most fun/memorable experience as a tutor? Learning language through music is both fun and engaging. How do you keep students engaged in learning a language like Chinese? This is a common problem faced by many parents and teachers here in Singapore. I always tell parents that the fastest way to learn Chinese is to send their kids to China for a good 10 years. They will come back with better Chinese proficiency, and may even pick up a Chinese accent. While this may be quite an extreme thing to do, I am only making a point here: Environment is a major factor when it comes to learning. There is a Chinese idiom that goes 耳濡目染, which means literally that both the “ears and eyes are influenced and engaged”. Environment has the ability to shape our learning experience. With regards to my earlier point about sending children to China, they may not be going there with a deliberate intention to learn Chinese. However, they are forced to be surrounded by a Chinese environment, to read Chinese billboards, signboards, food and instruction menus, travel directions, and listen to Chinese news once they switch on their television and radio. So here’s my question: How can their level of Chinese proficiency not improve at all? It’s almost impossible. 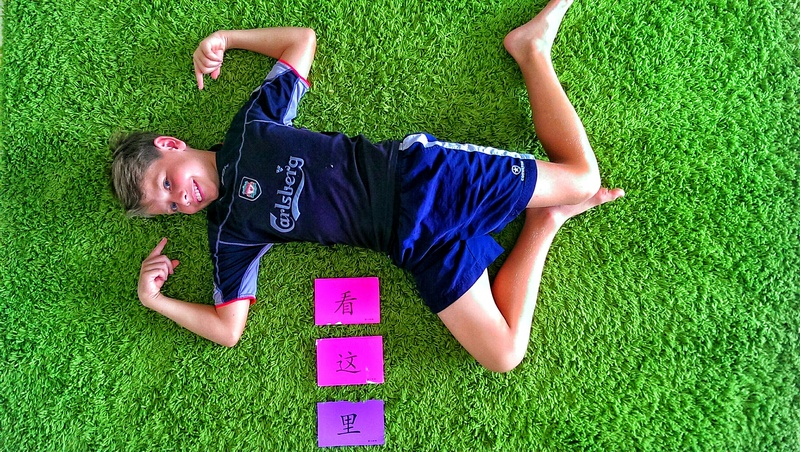 To put things back to reality, many kids in Singapore find it a chore to master the Chinese language, not to mention having to pore through dense paragraphs in their Chinese comprehension passages. That is why we always hear from them that they find learning language a “headache” to begin with. For a start, many of these younger generation are brought up in English-speaking modern families, as many of their parents tend to be more English educated. Having said this, there is thus a lack of practice opportunity back at home. Even in schools, many of them tend to converse in English. The only way to tackle this, besides having to go to China, is to keep reading, speaking, listening, and writing. The more exposed one is to the Chinese medium, the better. While requiring kids to read the Chinese newspaper may seem like a paramount task, there are other means to learn. You could watch a Chinese movie for example, and learn through subtitles for understanding. Or you could listen to your favourite Mandarin pop song from Jay Chou and pay attention to the lyrics used. Anson’s Bilingual Classroom aims to induce fun through learning the language. Elements of music, speech and drama are injected into my teaching pedagogy. With a strong passion for these fields, I seek to create constant engagement with the kids. I infuse song learning, for example, through children’s songs (儿歌) and influences like xinyao (新谣). These work particularly well with early learners of the Chinese language – both locals and foreigners alike. My point is, language learning should be flexible. It should be “out of the box”. While many local schools require a syllabus, the only way to sustain this interest to be a lifelong one takes much more effort than memorising words off the school textbook. And that is why I have a role to play here. I was randomly browsing through my Facebook newsfeed the other day when I came across this article shared by Shanghaiist’s Facebook page. The word above is called “biáng”. Though I think the act of writing it 1000 times is a bit too extreme, this caught my attention because I remember seeing the word before somewhere. Either that or I vaguely remember it being the most complicated word in modern Chinese history. I did a quick search and turned out my guess was correct. While there are various versions of the written word above, the one shown should be a 56-stroke character, based on my humble experience. 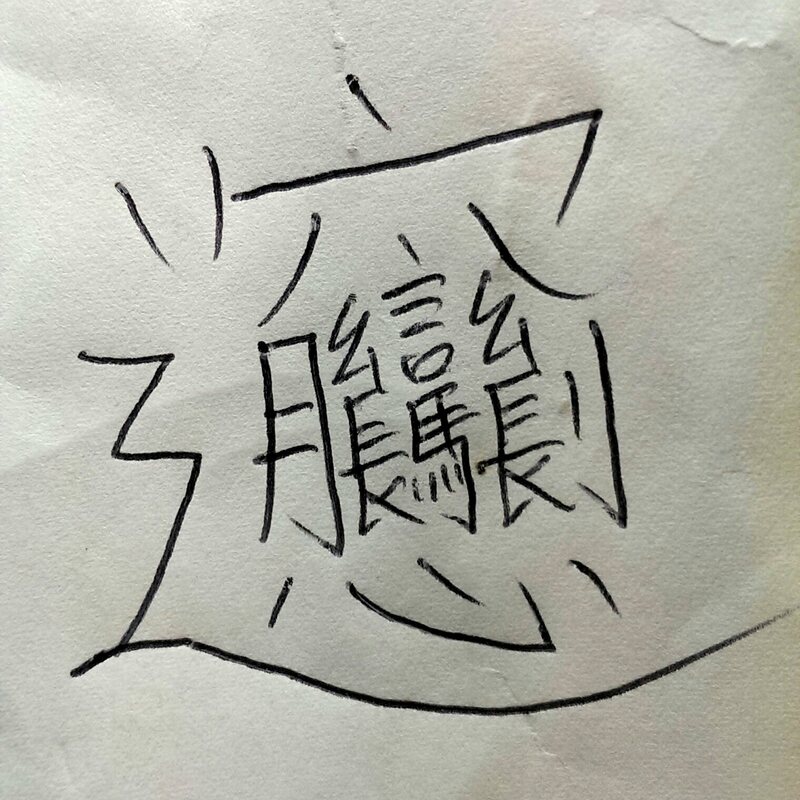 The character is made up of 言 (speak; 7 strokes) in the middle flanked by 幺 (tiny; 2×3 strokes) on both sides. 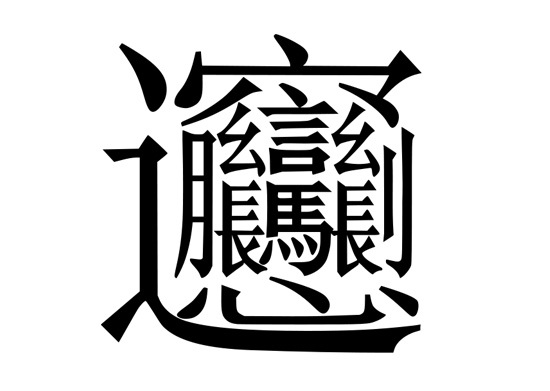 Below it, 馬(horse; 9 strokes) is similarly flanked by 長 (grow; 2×8 strokes). This central block itself is surrounded by 月 (moon; 4 strokes) to the left, 心 (heart; 4 strokes) below, 刂 (knife; 2 strokes) on the right, and 八 (eight; 2 strokes) above. These in turn are surrounded by a second layer of characters, namely 宀 (roof; 3 strokes) on the top and 辶 (walk; 3 strokes) curving around the left and bottom. Interestingly, the word, with mnemonics consisting of traditional Chinese characters has been around for centuries. There was once a young Chinese student wandering past a Shaanxi noodle shop around lunchtime. He heard people inside saying “biang! biang!” and feeling hungry entered to see for himself. ​The student watched the cook pull long strings of noodles and serve fresh bowls to satisfied customers. Excited, he asked for one. After scarfing down the bowl, he realized he had no money to pay the bill. Sensing trouble with the cook, the student thought fast. ​“Biang biang mian,” replied the cook. Before the cook could protest, the student grabbed some paper and wrote a character so complicated that everyone in the restaurant burst into applause. Grinning at being taken, the cook tore up the student’s bill. In other common versions of the story, biang comes from the sound of a cook slapping noodles against a table, or the chorus of people munching the noodles. Less important than the origin of the story is what it says about the language and culture. When I introduced this word to a student the other day, he couldn’t resist writing it numerous times. Whatever the word may mean, one thing is for certain. I think it looks beautiful, don’t you think? With that, you may want to try writing it and show it to your friends that you have mastered possibly the most complex contemporary Chinese word! Anson is a full-time bilingual tutor in Singapore who coaches students in both English and Chinese. For tuition enquiries, please call 97887232. As language learners, we all know that first impression counts. Whether it means saying ‘hello’ to a new acquaintance or writing your first paragraph of your essay, how you introduce yourself (or your voice in writing) matters. In this constantly spinning world that is unfortunately ‘spinning’ faster than ever – thanks to the plethora of information we are exposed to on a daily basis, attention spans are getting shorter and patience is running thinner. So my first post is all about making a stand. I have been teaching for close to 10 years, starting from my army days. Looking back, it was all about doing another part time “job” to pay the bills and support my entertainment expenses as a fledging young man who is still making sense of my pair of “wings” – my new found sense of freedom. After all, I consider myself a young adult, having moved away from mandatory primary school education and completed both my secondary and Junior College courses. I turned to teaching as a tutor because I thought it was something I could do. As an Arts major, I have always been inspired by the magic surrounding language and literature. I would find myself dabbling in fields of Arts, drama and music, and am still enlightened by these aspects even till today. I come from a Mandarin speaking family background and grew up conversing with my folks and siblings in Chinese at home. Of course, the daily Hokkien conversations between my mum and dad added vocabulary to my Hokkien literacy, though I seldom speak the dialect. I am fascinated by the beauty of languages and how they serve their purpose in this world. Anson’s Bilingual Classroom is founded with a few purposes in mind. While English is our official language in Singapore, I find that a lot of local students are learning it just for their exam grades. In fact, they fail to see that language learning is a lifelong commitment! As such, I hope to help develop their potential by showing them what works and what don’t. Next, I am proud of my heritage as a Chinese and would like to spread this further. As an educator, I am here to debunk the myths surrounding Chinese learning. A lot of kids grow up hating the language, some even complaining that reading Chinese give them headaches. Many do not know that we are speaking the tongue originating from a fast-rising dragon – China, and that the pervasiveness of the Chinese market is taking the world by storm. I have had foreign students with no Chinese backgrounds wanting to learn the language. Their parents know best why it is imperative to do so in today’s context. Parents look for me due to my versatility to teach both languages, and more importantly for the foreign students – to be able to explain Chinese terms using English, and vice versa. My classes are all about engagement and interactivity. I always believe that learning is a two-way process. By injecting fun elements into learning like word games and simple poetry and songwriting, I seek to nurture and inspire the next batch of learners through fun and impressionable exercises. I am elated to know that many students whom I have taught had managed to achieve their desired grades, and some whom have even gone on to pursue finer things in life. It is my hope to create long-lasting bonds with my students. There is always a first to everything. The challenge is to make it last. I look forward to inspiring new lives through language usage and appreciation, and welcome any feedback in the process. With that, I hope I have made my stand. Anson is a full-time language tutor and he can be contacted via email at anzzon@gmail.com or his mobile at 97887232. B for Boy. B for Believe. Want more language learning tips? Enter your email address to follow this blog and receive notifications of new posts by email.